Well we did it. We told the kids and they are excited, especially my daughter. Since we'll never get to make an announcement like this again, I wanted it to be fun. I liked the scavenger hunt and T-shirt ideas, but ended up doing something different. I'd done the T-shirt thing before and the scavenger hunt would require a trip to the baby aisle at the store. Not quite up for it. So ... I decided to put Mei-mei's most recent ultrasound picture in a box and wrap it up. The kids opened it together but couldn't quite figure out what the picture was (a blender?) so I had to help them out. "A baby!" "What? What baby?" "OUR baby!" "You're having a baby?!" Next I brought out a tiny cake I'd made. It had white frosting with a pink and blue question mark on top. 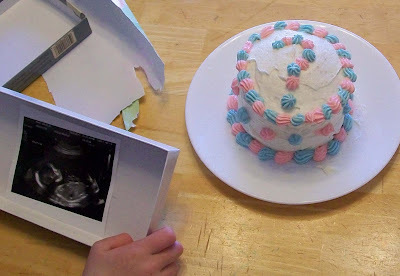 I told them that if the cake was blue inside then the baby is a boy and if it was pink then the baby is a girl. My son cut into it and my daughter screamed, "It's a GIRL!!" She is ecstatic and has been giving my belly hugs and kisses frequently ever since. I was afraid my son would be disappointed that it's not a boy, but he is excited and plans to train his sister to be a Jedi. He is obsessed with Star Wars right now. He also suggested that we share our news on Facebook. Um, NO. I don't need to worry about announcing this pregnancy to anyone else. The kids will see to it that everyone knows! The kids have both been able to feel the baby kick. My daughter was thrilled that Mei-mei started dancing when "Thriller" was played at an event we attended. It's been nice to see some unrestrained enthusiasm about this baby, especially since I'm still only very cautiously optimistic myself. Of course I've had to explain to the kids again why Jeremiah and Miles died and that we hope this baby will be OK. My daughter has said a few times, "I'm so excited about my new baby sister! I hope she doesn't die." So sad. I wish she didn't even have to think about that. I wish none of us did. Hopefully everything will continue to go well with this pregnancy so the kids' great expectations can be fulfilled. I totally hear ya on your daughter's comment. The other day LJ came in and asked if she could feel the baby move. When I told her that she wasn't moving around currently she replied, "If she's not moving, it probably means she's sleeping. Or she died." Aw cute! I love the Jedi comment! I love how you announced your pregnancy to the kids - so cute! I love this!! So glad the kids are excited. But that they understand the reality. So sweet. What a great way to surprise them. I loved it. I think it was perfect. So happy for you and your kids that you could all experience this excitement. Thank you for your post, I am almost 17 weeks pregnant after loosing our daughter at 19. My 7 year old is so cautiously optimistic, she hadn't even told her teacher yet that I was pregnant. I walked into the classroom and she couldn't believe my belly. My daughter says to people every time they comment on my belly. "hopefully this baby will make it." It breaks my heart. I'll be praying for you! oh i love it - that cake is so adorable!! That is so sweet :) Congratulations to you and your family!